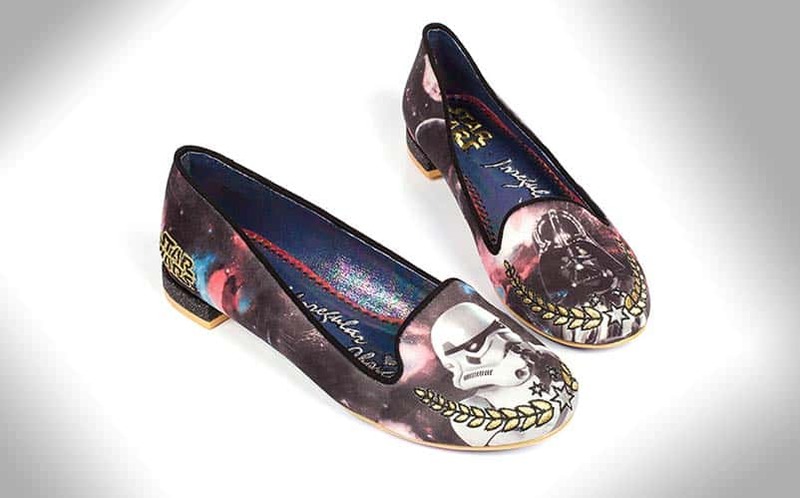 Star Wars Shoes: The Dark Side Flats | Nerd Much? If you find yourself not aligning with the conventional brands when it comes to shoe shopping, we’ve got a great find for you: The Dark Side Flats by ThinkGeek. These limited-edition shoes show your allegiance to the Dark Side, as they have a Stormtrooper on the right shoe and Darth Vader on the left shoe. Made by Irregular Choice, these shoes are created to go with anything you wear. Each shoe has white, black, gold, silver, pink, blue and purple, so you can virtually always find an excuse to wear them with your outfit. Not that you need an excuse; we fully support your decision to wear them whenever you’d like. In fact, wear them to bed if you want — no judgments here. The shoes are officially-licensed Star Wars merchandise, so you can be confident that you aren’t going to get a WindTrooper or Garth Bader (he’s like the country version of Darth, with a cowboy hat and everything — he’s a mess). There are other varieties available, including a pair of C-3POs. Of course, they make for perfect nerd gifts, so you might want to add them to your Christmas list before it’s too late. For more cool stuff to buy, stay tuned to Nerd Much for nerdy daily finds.